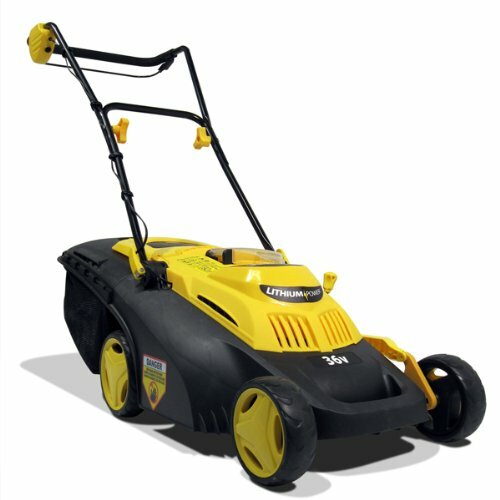 Modern and streamlined, this striking mower from Evopower is as revolutionary in performance as it is in looks. Boasting the very latest is lithium Ion battery technology, this mower promises to add a new dimension of freedom to your mowing experience if you’ve only ever known (and been hindered by) an electric mower with a cable. For small to medium-sized gardens the 30 minutes of running time will be more than adequate to get the job done, and with only 5 hours charge time required for the battery, you can decide to mow the lawn in the morning and have it ready to go by the afternoon. 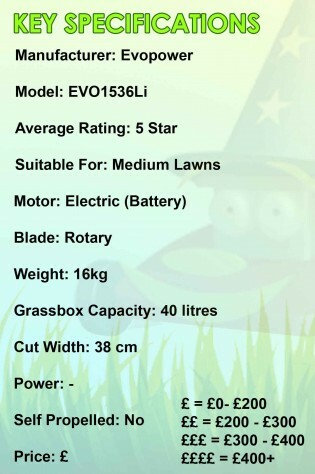 As one of the lightest battery-powered mowers on the market, the EVO1536Li is without competition when it comes to accessibility by all types of people including the elderly, and even better still it’s also one of the cheapest, at close to the £200 mark it competes with other electric mowers rather than being in the same price bracket as many petrol mowers. For the money you really can’t trump this Evopower lawn mower, it’s designed with a wide variety of users in mind, and to be as user-friendly as possible, thanks to being lightweight, and having easy to adjust controls, so for us it’s one of the best electric lawn mowers not to mention one of the best cordless lawn mowers currently on the market. There is always a downside of course, and in this case its the short running time relative to the time it takes to charge the battery, but that’s the compromise you make if you want something light weight. A bigger battery will run a mower for longer but it will also be heavier with it.